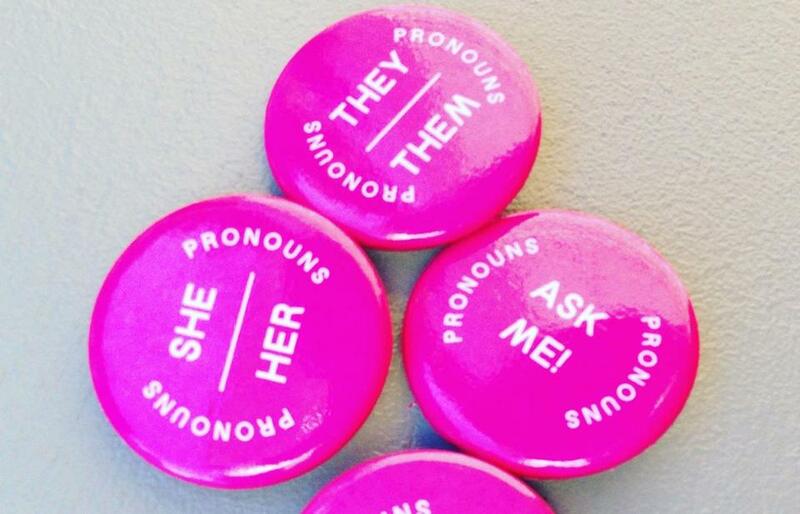 The XOXO art and technology festival in Portland, Ore., distributed pins so attendees could make their identifying pronouns clear. Things have changed since 2013. As trans and nonbinary people have gained more public visibility, so has the singular “they.” The Washington Post sanctioned its use in 2015, the same year that the singular “they” was voted the Word of the Year by the American Dialect Society. 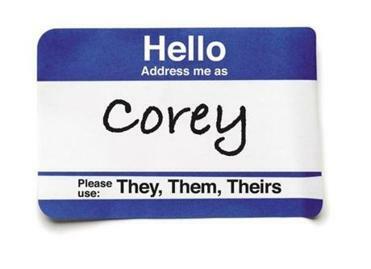 In 2017, the Associated Press Stylebook and the Chicago Manual of Style, the guiding lights for almost all published writing in America today, both allowed the use of the singular “they” for individuals who, like Herrera, do not use the pronouns “he” or “she” to identify themselves. Jennifer Lopez has been lauded in the checkout-stand glossies for using the singular “they” to refer to her sister’s child in an Instagram post. More and more college campuses ask students and faculty to share the pronouns they want to be identified by — “he,” “she,” “they,” or something else entirely. But whether social conservatives like a term, or newsroom copydesks permit its use, matters far less to linguists than whether people use it with ease in everyday conversation. For the average person, using a gender-neutral term such “firefighter” requires no more mental gymnastics than saying “fireman.” Yet the pronouns we use in English seem more deeply embedded in the structure of our language than these more specific occupational terms. But as fixed as our pronouns seem to be, many English speakers have felt that they don’t quite work for everyone. Unlike some languages, like Cantonese and Finnish, the English singular third-person pronouns have grammatical gender; when you want to talk about someone , different pronouns are available to indicate that person’s gender. “He” and “she” seem straightforward; “it” applies primarily to inanimate objects and sometimes animals. So what do we use when we might want to refer to any person regardless of gender? Or, as seems to be the modern case, a person who is neither “he” nor “she”? “Nature abhors a vacuum,” says Dennis Baron, a professor of English and linguistics at the University of Illinois at Urbana-Champaign, “so let’s fill it with something.” English speakers have tried to fill the pronoun gap with invented and genderless alternatives to “he” and “she.” In the course of researching the history of pronouns for his forthcoming book, Baron has gleaned 250 proposed pronouns going back as far as the late 1700s, including “hiser” (ca. 1850), “thon” (1858), “ze” (1888), “hir” (1930), and “ve” (1970). Words like “them” used to be scolded out of speech when paired with a singular, identifiable subject. Now, they’re being embraced. But the abundance of invented pronouns catalogued by Baron raises an important if nagging question: If there’s such a need for them, why haven’t we adopted any of them? The answer may lie in one four-letter word that has been proclaimed to both be a shining light of lexical flexibility and a harbinger of grammatical doom: the singular “they.” In all its uses, it is centuries older and more established than most people realize. There are two intertwined singular “they”s in use. The first is what linguists call the epicene “they” — the “they” we use when the gender of the referent isn’t known or relevant to the sentence at hand: “Everyone should bring their own notebook to school.” The second is the use of “they” as a personal pronoun by people whose identity is neither male nor female. Critics malign both of these “they”s as recent inventions, but neither of them is. The epicene “they” is more familiar to people, and no wonder: It has been in consistent use in English prose since the late 1300s, even as grammarians and language writers rail against it as ungrammatical and sloppy. The written record bears this out: The epicene “they” has been used by Chaucer, Shakespeare, Jane Austen, Charles Dickens, George Bernard Shaw, and dozens of other writers who are both grammatical and precise. In speech, epicene “they” is so common that linguists groan whenever someone takes up arms against it again. All the major American dictionaries (including the one where I worked for 20 years) enter this particular use of “they” and defend it in their usage notes as entirely, blandly normal. Yet even though English speakers have deployed the epicene “they” for the better part of a millennium, self-appointed grammarians began stigmatizing this usage in the 1700s. And when “they” was prohibited, it left an epicene-shaped hole in the language, and invented pronoun mania — “thon,” “ze,” and more — swept the English-speaking world. Flexibility on matters of gender makes some people uncomfortable, and grammatical purity becomes a scapegoat upon which the sins of the singular “they” are heaped. But grammar is subject to change. The nonbinary “they” isn’t even the first pronoun shift that English has gone through: During the 17th century, ”you” underwent a similar change that has also been attributed to the politics of respect. Sure, new words come into our language, but when people think the old ones are getting messed with, some see a cultural and grammatical decline. In the end, upward mobility proved more popular than Quakerism, and the formal plural pronoun “you” replaced all forms of the second-person pronoun. Is it possible that we’ll eventually see the elimination of “he,” “she,” and “it” in favor of “they”? The royal “you” began with the tiny ruling class of 17th-century Britain — a much smaller population than the number of trans and nonbinary people in the English-speaking world today.